Delegates at the EDA Regional Business Forum at the LIA HQ in Telford heard that the take-up of apprentices among EDA members has increased from 18 in 2013 to 70 a month so far this year – but women are still poorly represented. Margaret Fitzsimons – with the help of John Henry from EDA Apprenticeships Plus and Apprenticeships Manager Carmen Daley – revealed the figures at the Association’s penultimate Regional Business Forum for 2016. Carmen (pictured right) echoed this sentiment, noting that this scheme, set up by the EDA for its members, has Trailblazer and Apprenticeships Levy involvement. It is independent of any training provider or college, so it drives up standards and acts as a single point of contact for apprentice recruitment. The Product Knowledge Modules prepared by MOL have also been successful, with ever greater take-up among young men and women. Even so, Fitzsimons thought that branch managers needed to do more to extol the benefits of taking the modules for future careers – as well as the consequences of not doing the required work. Of the many modules, which cost £150 each and represent 40 hours learning in 12 weeks, the Fundamentals of Electricity is the most popular, and probably the most important. Margaret concluded by discussing the EDA’s independently conducted survey of wholesaler and manufacturer members’ concerns and opportunities. You can read more on the survey in the October issue on Taking Stock. Make sure you are signed up to Electrical Wholesaler Magazine to ensure you receive your copy. The forum was moderated by Ray Smith, who retires this month. 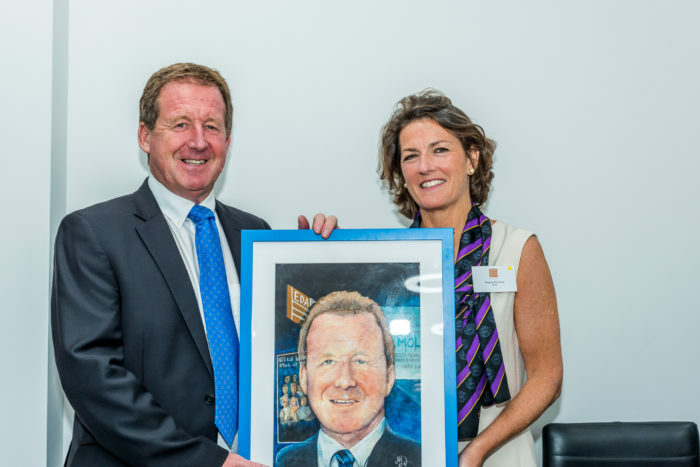 He, was presented with a specially commissioned portrait. The venue was the Telford headquarters of the Lighting Industry Association (LIA), also the site of a newly completed, world class lighting compliance test laboratory. LIA CEO Steve Davies provided an overview of what the LIA does at Telford, now largely lighting compliance. After this, Steve Davies guided EDA members around the lab. The LIA is becoming more commercial and is a fully independent test house. 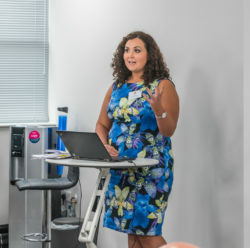 LIA’s Commercial Manager, Julie Humphreys gave an introduction to the LIA Academy and Simon Cook, Head of Sales, talked about the Performance Verified Scheme.